Internet Explorer on your Windows 8 tablet remember everything you search for on the Internet. You can delete your past searches while in the Start screen’s browser, but it strips away everything. 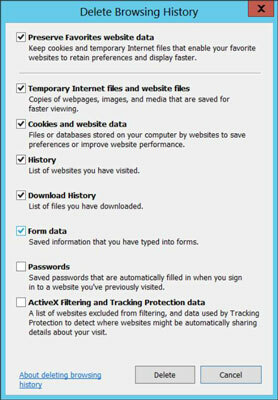 You lose your list of visited websites, as well as your saved passwords, your cookies, and all other temporary files created while browsing. When the drop-down menu appears, tap Internet Options. Then tap the Delete button in the Browsing History section. The Delete Browsing History window appears, letting you choose exactly what to delete. The browser deletes what you’ve chosen, preserving the rest. For best results, leave the first option checked. Doing so preserves the settings from your favorite sites.